Ionia County, Michigan Horse Directory - O Horse! Private horse boarding facility in Portland, Michigan. Specializing in dressage horses, but also offering a fantastic facility for other show and pleasure horses. A quiet horse environment in Michigan. Small, private, boarding facility. Wood fences, matted stalls, 100 by 200 outdoor sand/rubber footing, quiet roads and trails in area. 3-4 feedings per day. Excellent care with over 30 yrs experience. 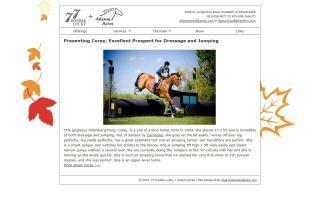 Horse boarding and training available at C.A.J. Ranch L.L.C. Board is $150 per month (as of Aug 2009) and includes hay, grain, and run-in shelter. The property has a wooded area to ride in and is close to country roads. Short term boarding accepted. Located 10 miles north of Ionia and 1/4 mile off of M-66 in a peaceful country setting. For a tour of the property or for more information, contact us at the number above or visit our website.